I have written before how my characters are formed first before I consider plot but I have been forgetting a crucial element, theme. The theme in Claudia’s Big Break — women, generally in their thirties, who are at a cross roads in their lives —is a theme that runs through my other two books, Lucy Springer Gets Even and What Kate did Next as well. When starting a new manuscript, I’ll think about the general theme and develop it more specifically, for example infidelity and its’ repercussions, and then create a character to embody that crisis. Whilst the characters in every book are very different, they are all struggling with real issues women face such as aging, betrayal, divorce, teenage sexual awakening, career frustration, loss of independence, friendship, etc. In each of the novels, the characters start in a difficult place but by the end of the 85,000 words they are on their way to resolving those issues. They are not going to lead perfect lives but the characters have developed the strength and determination to keep going and moving forward in a positive direction. I always write in the first person so while developing Claudia, Kate and Lucy’s stories, I imagined living inside their heads to make their personalities, motivation and dialogue as emotionally authentic as I could. While Claudia is the main character in Claudia’s Big Break, the story revolves around the relationship between three long-time best friends: Claudia, Tara and Sophie. All are in their thirties and are struggling with personal issues: Claudia has a less than stellar career and love-life, Tara is trying to overcome personal demons so she can finish writing her novel, and Sophie is dealing with the transition from corporate lawyer to stay-at-home mother. What excited me about writing this novel was creating the intricate and often tricky relationship these women have, and playing that out against the idyllic Santorini back drop. With What Kate did Next, the focus is very much on Kate and her coming to terms with the fact that the dreams she had at twenty are no closer to becoming a reality as she approaches her thirty-sixth birthday. Lucy’s husband in Lucy Springer Gets Even walks out on her in the first sentence, so her journey starts in a very bad place, that of being totally blindsided and having to rebuild her life. I can’t see the general theme of my books changing. I like writing about women, what drives them to succeed (or fail), how they react to adverse situations and how, even though they may start from a dark place, their strength of character pulls them through in the end. My characters generally aren’t going to get ‘the happily ever after’ of fairytales, but I hope that they are interesting and inspirational regardless of how flawed they appear. 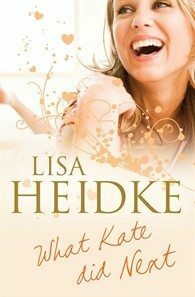 You can find out more about Lisa at www.lisaheidke.com. Thanks for visiting, Lisa! I agree with Kylie. I think the hardest thing about first person is ensuring that all your books do not sound exactly like you! Well done – and great post. Nice to learn a bit about your writing process. I loved your first two books and “Claudia’s Big Break” is on my TBR pile. I’ve been saving it for a while, enjoying the anticipation of a great read. Thanks Kylie! Once I get the characters cemented in my head and start writing as them I am confident that the women in each book are all very different women, but yes, they are similar ages with similar life experiences. Maybe I should broaden my scope…next time! I agree. I do write about women I would like to read about as well. I’m just glad I’m not in their situation. Have just looked at your website. Will be putting What is Left Over, After, on my must buy and read list. Thank you! Nice to hear. Thanks very much! Thanks Anj! I’m looking forward to reading your fiction too – hint, hint!